Dr Jeni Klugman, Managing Director, Georgetown Institute for Women Peace and Security, Fellow at the Kennedy School of Government’s Women in Public Policy Program, Harvard University; Hon Dr Sharman Stone, Australian Global Ambassador for Women and Girls; Dr Anu Mundkur, ACFID Secondee to the Australian Civil-Military Centre. Countries are more peaceful and prosperous when women are accorded full and equal rights and opportunity. The new global Women, Peace and Security Index from Georgetown University’s Institute for Women, Peace and Security and the Peace Research Institute Oslo identifies challenges and opportunities for transformative change. The index incorporates three basic dimensions of wellbeing—inclusion (economic, social, political); justice (formal laws and informal discrimination); and security (at the family, community, and societal levels)—and captures and quantifies them through 11 indicators. It ranks 153 countries—covering more than 98 per cent of the world’s population—along these three dimensions in a way that focuses attention on key achievements and major shortcomings. 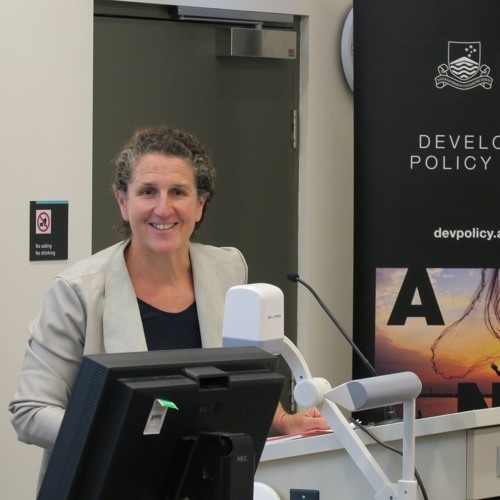 At the Australian launch of the index, Lead Author Jeni Klugman shared details on the main findings, and the utility of the index for groups such as policymakers, civil society and the private sector. She was joined by Australia’s Global Ambassador for Women and Girls, the Hon Dr Sharman Stone, and Dr Anu Mundkur, Australian Council for International Development’s representative on the steering group of the Australian Civil Society Coalition on Women, Peace and Security, to discuss the implications of the index more broadly. The event was followed by a networking reception.